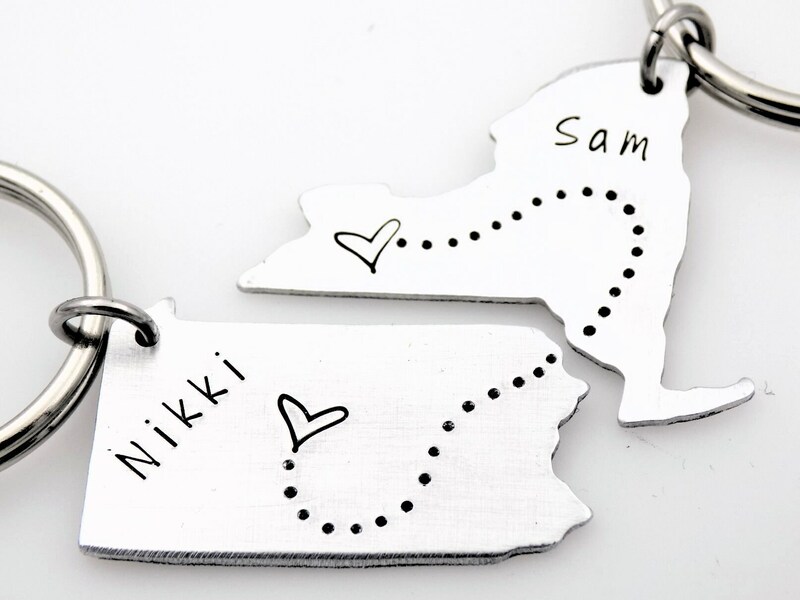 We can stamp the heart centered, or near cities of your choice. Please also leave either the names (and specify which name goes on which state). If you want a date or initials instead of names we can do that instead. We customize this with hearts over locations of your choice. Please note unlike our other listings, this set does not have a loop and has dots stamped instead of dashes. We can also stamp a single name, initials, or a date of your choice. ·You can either have hearts centered, or stamped near cities of your choice. Adding cities will make this item customized, and will NOT be eligible for return. they will not fit each other like a puzzle. ·States are not to scale. ·Size varies by location, most are between 1"-1 1/2"